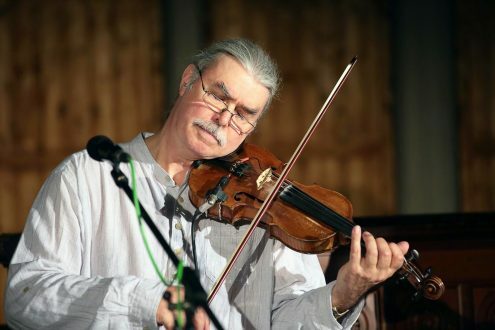 Steeleye Span rocked up traditional British folk songs in the ’70s, and Peter’s fiery violin was a key part of the sound. Starting with Sails of Silver (1980), they added folky-sounding originals to the mix, and Peter’s (often piano-based) compositions (like the hit “Let Her Go Down“) were among the group’s most heartfelt. His current unit is the trio Peter Knight’s Gigspanner, featuring Roger Flack on Guitar and Vincent Salzfaas on Congas and Djembe. We talk about being creative with traditional music, authenticity, and finally getting the hang of songwriting late in his career. We discuss “We Shall Wear Midnight” from Steeleye Span’s Wintersmith (2013, with author Terry Pratchett), “Bows of London” from Gigspanner’s Layers of Ages (2015), and “From a Lullaby Kiss,” a 2014 solo tune. We conclude by listening to “Who Told the Butcher” from Steeleye Span’s Bedlam Born (2000), and the intro music is “The Butterfly” from Gigspanner’s Lipreading the Poet (2008). Check out this transcendent Peter Knight recent sound check improvisation. Here he is with Trevor Watts in 2009. Here he is performing with Feast of Fiddles. Watch the video of “From a Lullaby Kiss.” Hear much of Layers of Ages and other Gigspanner/Knight tunes on SoundCloud. Hear his new, somber version of “Hard Times of Old England” and the old, chipper Steeleye Span version. I brought up their early “Blackleg Miner” (Tim Hart and Maddy Prior singing; this is from the first album before Peter joined); you can see how that song evolved to this live 2008 version here. Peter also mentions a different version of the story behind “Bows of London” called “Three Sisters,” which Steeleye performed with Ken Nicol on lead. We also mention Peter’s rockin’ love song “Lord Elgin,” “Gone to America,” and his 1995 tune “The Song Will Remain” (which is for sure about death!). Buy Terry Pratchett’s Wintersmith book.